Google Plus – What’s Your Story? Google Plus introduced “Communities” a short while ago and I think it is a real game-changer. I think it will at some point catapult Google Plus into the lead social media platform. Google Plus is still a little hard going in terms of local interaction, but if you have a product that can be sold worldwide, or interests that span the globe, then Google Plus is an exciting platform. In relation to my local business, I post to Google Plus and persevere in doing so even though there isn’t much interaction with local people, because I am sure that it will grow in time. In the meantime it is an opportunity to stand out in front of a small number of people, and, of course, benefit from the links to your website and Google authorship. Google Plus really came into its own when I published a book and joined some writing communities. Not only did I pick up some great tips, I found beta-readers and got to know people from across the globe. No social media platform stands alone, so when I combined Twitter and Google Plus in terms of marketing, the results were powerful. Social media works well for me because I’m inquisitive (i.e. nosy), I’m genuinely interested in people, and I like reading and learning. I come across lots of blogs, read them, find the author on Twitter or Google Plus, follow them, re-tweet them, reply to them on Google Plus and generally interact with them. I only do this when I have something genuine to say and am genuinely interested in that person. Sometimes I also buy their book. Even though I use social media primarily for marketing, I do it in an organic way that combines my personal interests. This might sound like I’m a stalker, but you know that old marketing adage that people need to see your name seven times before they remember you, and probably a lot more than that before they buy from you? Well, when people see me on a number of different platforms they are more likely to remember me. There was one time this week, though, when I did worry that I was looking like a stalker. There is a poet in one of the writing communities who has been publishing a lot of his poems on Google Plus. I don’t always like poetry, but I love his poems. They speak to me, and stir up emotion in the same way that beautiful music can touch your soul. As I said, I’m nosy, so I tried to find out more about him. There wasn’t much online, so I messaged him asking if he was going to publish a book of his poetry. He replied that he had only been writing since February. I see his poems all the time when I log into Google Plus. I want to show my admiration for his work, and I know how much praise means to an author, but the question is, if I constantly promote him and give each poem a +1 do I look like a stalker, or will he be grateful for the praise? If he published a book of poetry I would gladly buy it. And I think that’s the key both for authors and businesses in general – it’s about finding a way, through writing blogs, publishing excerpts of your work, and interacting with people, to create a “like, trust, buy” scenario, to draw people to you who will naturally like you. 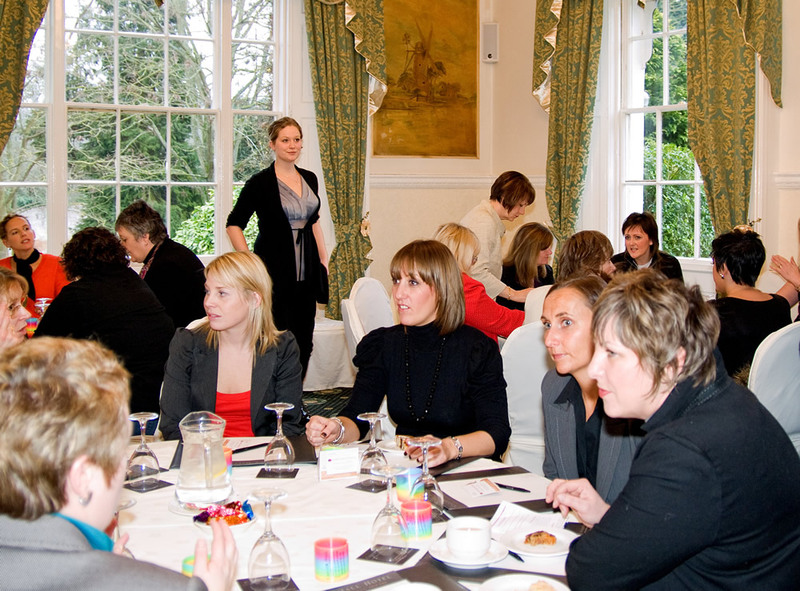 I run a ladies networking event called Coffee at Caistor. Each month we ask for three volunteers to speak for five minutes about themselves. We ask them to talk about their life – how they got to where they are – not to try to sell us their products. On the odd occasion that someone just does a sales pitch it doesn’t go down very well. On all other occasions we hear some great life stories. People remember stories, and usually come away liking that person much more. When you like someone you are more likely to buy from them. I remember so many people from that group by their story. Often it has completely changed my impression of them – for the good. As most authors are masters of stories, this is the ideal way to promote their work – blogging and the use of social media platforms is the online equivalent of telling your story as a subtle sales pitch. If you are a business, it is useful to find a way to tell your story – how your business came about, the story behind your products, the people behind the business. Sometimes when I have been struggling to write a sales email, I will sit in a cafe and think about the story. Those emails which have a story get a much better response than our normal emails. What do you think? Have you bought a product after reading something online? Do you like getting to know the author when you buy a book? What do you think of Google Plus? Has it worked for you? And finally…..what’s your story? Feel free to share. Book Launch, a Rather Large Croissant at Lotus, and How my Clients Ended up in Bed. I’ve been blogging a lot about my book launch lately, which makes it sound as if that’s all I do. But in our main businesses, thebestof Norwich and Bright Yellow Marketing, we’ve held some fascinating events lately. Last month the head of marketing for Lotus gave a talk to our thebestof Norwich members, followed by a tour of the factory. After the excitement of one of our delegates driving straight through security without stopping, and finding herself blocked in by a security contingent, we all chatted in the Lotus Originals Store before hearing the talk. We are very relaxed about our events, but didn’t know what to expect when Lotus joined thebestof Norwich as a client and offered to host an event. Luckily the in-store scalextric track got everyone feeling at ease, and the Lotus team were very welcoming. The store is amazing – quality Lotus gifts and clothing, including the “Originals” collection, the classic “Heritage” range, the Lotus F1 Collection and a performance range “reflecting the engineering soul” of Lotus. Lotus kindly sponsored the event, supplying croissants, coffee and tea, and a free tour. As we left for the tour of the factory, my stomach was rumbling. I purposely hadn’t eaten anything whilst we were networking, so I grabbed what I thought was a small chocolate twist. It wasn’t small. It was massive! Part of it had been hidden under a napkin. It was too late to put it back down, but I realised that I couldn’t take it into the factory with me, so ended up trying to discreetly eat a gigantic long chocolate croissant on the short walk from the store to the factory! OK perhaps it wasn’t so discreet. The factory tour itself was fascinating. I was not expecting to see so much of the work done by hand. It was very organised. Everyone came out wanting a Lotus, even those who had entered the factory swearing they would never want to own one. That week we also ran social media training for some of the other thebestof franchisees in the fantastic training suite in Solihull. The training went down so well that they booked us in to run more training – a huge compliment. Since then, we have also started running fortnightly social media mentoring workshops. I was a bit worried as one or two of the delegates already use social media a lot, but they gave us brilliant feedback. Last week I ran a ladies event called Coffee at Caistor, chatted to a client over scrambled egg on toast at our regular morning meeting, and on Friday we ran a client-only networking event where our clients ended up in bed! This Friday I will be on a luxury cruise of the broads – all in the name of business, of course. In between all of this we have had various meetings, updated the website, promoted our clients through social media and blogs, created a printed newsletter, organised a marquee at the Royal Norfolk Show, met up with clients…and published a book. The only thing I haven’t done? Actively looked for new clients! Our new website changes are kicking in, though, and this week we have had a flurry of new enquiries via the website – actually, today it was more of an avalanche. Everything we do is geared to encourage people to contact us, or recommend people to us, rather than us cold-calling businesses. 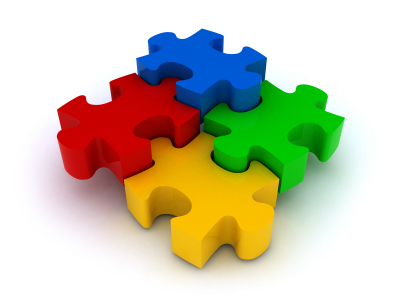 It makes business much easier, and frees us up to focus on our clients. The website changes make it easier to promote our clients on social media as well, so all in all, it’s a good month. Although our two businesses are based very much online – one has a website at the hub, and the other is based on social media, you can see that my life revolves around people, and the relationships that we create with people. Well click here to find out. 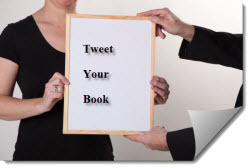 This weekend I did a free promotion on Kindle of “How to Tweet Your Book” – primarily in order to get some reviews, but also to help to increase awareness of the book. Amazon now only show reviews from people who have bought the book and, although people reviewed the book before I published it, it seemed rather rude to ask them to buy the book AND write a review – hence the free promotion this weekend. I am usually very organised, with lists all over the place, but was a bit slap-dash with this promotion, probably as I was tired after a week running two networking events, as well as all the usual day to day work running a business – all with a cold. I am very aware that although it is tempting to sit all weekend at the laptop or ipad, and it doesn’t feel like work, I need to rest or do something different, otherwise I am too tired the following week. So, on Saturday morning I posted details of the book on the promo websites that didn’t need any prior notice, and I posted some links to facebook, Twitter and Google Plus, as well as contacting my previous reviewers direct. 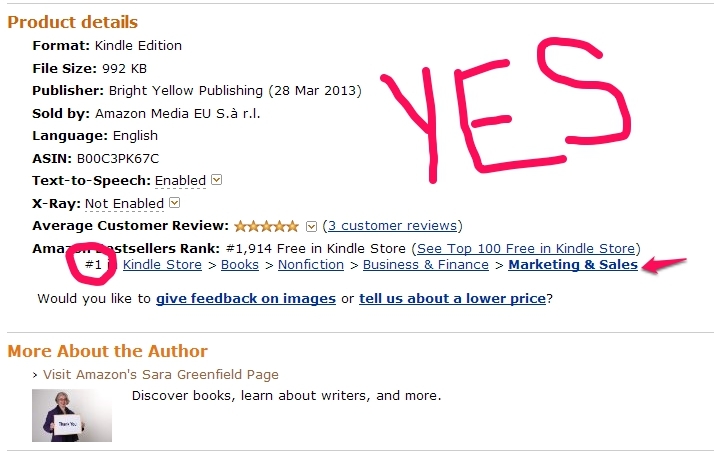 By mid-afternoon my book was #1 in the Sales and Marketing category on Amazon kindle. Much of the social media work was done on my ipad stretched out on the sofa, or between watching my favourite Saturday evening TV programmes – a useful distraction from the ads. This morning it was a glorious sunny day so I went for a run, sat in the garden reading, and did odd bits of promotion on the ipad – not as much as I had planned because the rare good weather was too good to be spent indoors. The only bit of real promotion I did was to send an email to one of my databases and I also added a discussion on one of my LinkedIn groups. I could have messaged all of my LinkedIn contacts but decided against it at this point. It’s now Sunday afternoon and the book is still #1 in the Sales and Marketing category on Amazon.co.uk, #2 in the Marketing category on Amazon.com and #3 in the Sales and Selling category on Amazon.com. It will be interesting to see how it performs after the promo, but the best part is that I have gained some wonderful reviews and have been overwhelmed by the support of people I know, including quite a few social media professionals. It is actually a very scary process putting your book out there into the public realm, so these reviews are so welcome. It feels as if I have made a part of me public, and I keep wondering whether I sometimes say too much. I am a very honest person – I would find it impossible to be something that I am not, but that honesty makes you vulnerable. This is probably one of the biggest things that people struggle with – it cuts straight into the “what to Tweet” dilemma. How much of your Self should you expose to the public; where is the line between personal and business? As a small business owner, it is easy to blur the lines, and, although scary, that is part of my success online. If you are an employee, then it is much more difficult. What are your views? How much of a line do you draw between your public and private life? Nestivity is a way to turn tweets into discussions. I have a myriad other things to do but on Saturdays if I happen to give in to my work ethic and turn on my laptop, I allow myself some free range reading and learning time. Although there is a load of other work piled up, this weekend time is important for me to learn new things and experiment. So, rather than writing blogs for my clients, updating the website, writing that next sales email, I gave in to temptation and allowed myself to get sidetracked with a new product. So, how best to use Nestivity? There wasn’t a lot of existing content to use as a reference, so, as usual, I just dived in. I think a lot of people are scared of doing things wrong on social media, but I think you just have to experiment. If it doesn’t work, then you just stop doing it. Originally I used my personal account but then realised that authors would be worldwide and would not be interested in my many Norwich tweets. The downside to this is that I have written a book about How to Tweet Your Book with an accompanying Twitter account that doesn’t yet have an amazing number of followers. “Patience, patience,” I keep telling myself. Having managed to write and self-publish a book when working on it only on weekends, I can’t expect everything else to suddenly fall into place. When trying out the beta version of Nestivity I chose to use my @tweetauthors account as it is very niche, and has a lot of opportunity for discussions relevant to authors. I love being one of the first to use a new platform or tool like this as it gives you access to thought leaders and influencers before everything is drowned out in the noise. If you have any views on this matter please feel free to join in the discussion here. If you’re interested in Nestivity then there is a good introduction here. It’s not often that I get annoyed with people but one thing that does annoy me is when a person or company gets too big for their boots and unfollows most of their followers. They do this because they think it makes it look like they are someone special- in other words, they are so wonderful that thousands of people follow them, but they are too busy and important to follow other people back. I get updates on followers and unfollowers using a tool called Socialtoo – this gives me a daily email with a list of follows / unfollows. I can easily follow people direct from this email – it saves me lots of time. After getting back from holiday and catching up with these emails, I noticed that a large local agency had unfollowed me. When I looked at their Twitter stream I saw that they suddenly had a lot of followers but were following very few people. I was not surprised because their email newsletters are all about “me, me, me” – they are full of “what we have done recently” rather than giving any useful information. I don’t actually mind people unfollowing me – I rarely look at my Twitter following, unlike the early days when you avidly watch your followers increase, hoping to get to the first hundred, then the first thousand. Nowadays my personal Twitter account seems to take care of itself and my focus is on other, newer accounts that I am growing. So if I don’t worry too much about people unfollowing me, why was I so annoyed? I was annoyed because it is the height of arrogance for a business to place themselves on a pedestal and think they are too important to follow other people. What they are saying is that they have no interest in the tweets of anyone but themselves. Personally I think this stance will backfire. If I look at an account that follows back very few people, I won’t usually follow them, unless they are a thought leader and I know that they tweet exceptionally useful information. The same thing happened a few years ago. I followed someone on Twitter, re-tweeted them lots, chatted to them lots, even bought their book. Then one day they decided to unfollow everyone to make their account look like they were a “celebrity” account. Well, you can guess my reaction. I unfollowed them and stopped interacting with them. If they lost one avid fan, like me, I wonder how many other fans they lost. The essence of Twitter is that you take an interest in other people – it is called “social” media for a reason. Anyway, rant over – hope I’m not turning into a grumpy old woman. I’m actually a cheerful, half glass full type person, and rarely criticise others – only when it comes to Twitter DMs and non-celebrity “celebrity” Twitter accounts! I seem to have been on a very circuitous journey learning about “web stuff” this week. We are specialists in social media and local marketing, but we tend to keep away from anything related to creating websites. My knowledge in relation to websites is fairly limited. Our bestof Norwich website is done for us by developers at our head office, and with Bright Yellow Marketing, I work with a wonderful design graduate who set me up with a wordpress website and who helps me when I get stuck. I didn’t have a budget for Bright Yellow Marketing – it’s our second business and has to be self-funding. I don’t want to be reliant on any bank loans or overdraft. The reason we set up Bright Yellow Marketing was that there was a demand for social media training. The Bestof Norwich, our main business, is all about promoting recommended local businesses and if we were offering training as “thebestof” then the implication is that we are endorsing anyone who is a client. We wanted the training to be open to anyone, regardless of whether they had been vetted as “thebestof”. Bright Yellow Marketing also opens up wider markets. I have just written a book on “How to Tweet Your Book”, which obviously has an international niche market. Because Bright Yellow Marketing was self-funding, I started off using a free crm – capsule crm – and linked it to Mailchimp to send out newsletters. I found, though, that I didn’t send out newsletters very often, partly because we were so busy with our main business, thebestof, but also because of the hassle of having two separate systems. Now that we have a more stable income from Bright Yellow Marketing, I can look at some paid for services. The other day I bought a wordpress plugin that I thought would do a lot more for me that it actually does! But what it has done is taken me on a huge learning journey. Learning is always a good thing. This plugin referred to Aweber in it’s demo videos. I’d heard a lot about Aweber and thought I would have a look at it. We have been using Swiftpage until now for thebestof, along with a bespoke crm, but Swiftpage no longer supports the excel plugin, which is annoying me. At the same time a client asked me to source the best crm / email system for him, so my research in this area was going to help not only both my own businesses, but also a client. I signed up for a £1 trial of Aweber. We have used lots of email and crm systems in our time – infusion, ACT, Swiftpage, intouch, capsule, Mailchimp – so I have a good base of comparison. Then, to utilise the new plugin, I also needed to be able to create a new wordpress page with a shopping cart or a “buy now” button. My wordpress lady had added a light shopping cart plugin, but then I got sidetracked wondering whether I would need the better, paid-for version, and trying to work out what the difference was. After much thinking, I realised that what I actually needed was a “buy now” button rather than a fancy shopping cart. Before I could even add this, I needed to understand a bit more about PayPal. By this time my brain was about to explode. It seemed that every time I thought I was nearer an answer, another question popped up – so many new systems to get my head around – Aweber, paypal, wordpress plugins, crms, shopping carts….. so I did what I usually do when I’m struggling to understand something…. ….. I drew a mindmap. 2. Finding the right email system / autoresponder system/crm and deciding whether to change from what we currently use. 4. Work out whether to use a shopping cart, and if so, which one. It turns out that you can’t just import the PayPal code for a “buy now” button on a wordpress website. 5. Work out how to use the shopping cart plugin and add the code in the right place. 7. Check that all these various systems that I was planning to use, did in fact integrate with each other! 8. Putting it all together to get a finished product. And I have done it! Looking at the resulting very simple wordpress page, it is amazing that it took so much work. You may wonder why I went to all this effort over a weekend, when I could have outsourced it. I outsource as much as I can, but actually this learning experience was very useful. It also means that the next time I want to add something to my Bright Yellow website I will know how to do it and be able to make the change immediately – whether it is midnight on a Sunday or the middle of the week, rather than waiting for someone else to do it for me. Putting in a lot of work now will save me huge amounts of time later, especially as it will enable me to automate a lot of things – handy for book sales – and will make it easier for people to buy training or other products from us. And I have come up with an interesting solution for my client – something I would not have thought of if I hadn’t been trying out all these systems. Well, that’s my argument, and I’m sticking to it! What systems do you use and what do you think about them?